The right tire for the conditions is important. 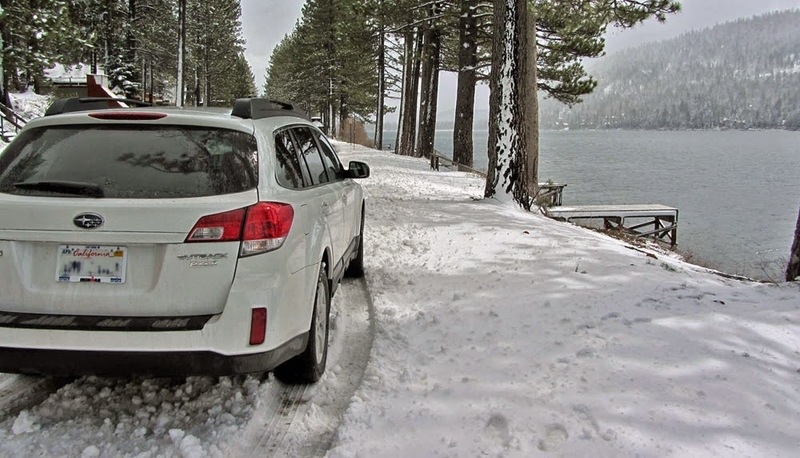 If you live, work, or play in the Tahoe Basin during the winter, your car/truck should be fitted with winter specific tires. Winter tires will reduce your stopping distance and provide better steering. Don’t be the guy who spins out, gets stuck in a snow bank, or just stays home because of bad weather. All-wheel or 4-wheel drive is not enough. The typical tire on your car/truck is a general purpose tire labeled “all-season” or “mud and snow”. These tires perform well in a variety of conditions, but they underperform in cold temperatures and on slippery surfaces. 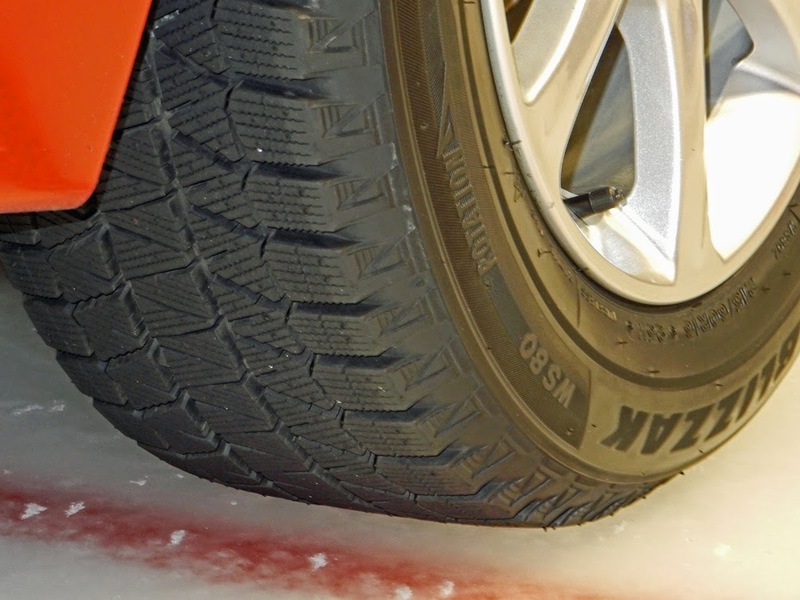 A winter tire is optimized for these conditions with special tread designs and advanced rubber compounds. Tire Rack and Bridgestone gave me the opportunity to drive and compare tires at their “Winter Driving Experience” in Denver. 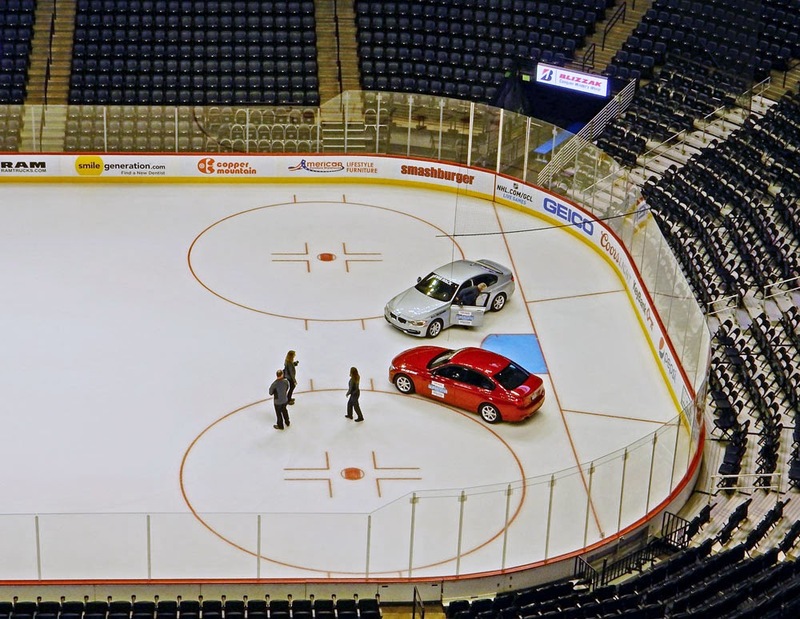 The “test track” was the ice hockey rink in the Pepsi Center, which is home to the Denver Avalanche. Two cars were provided, one shod with all-season tires and one sporting Bridgestone’s latest iteration of their Blizzak winter tire. The performance advantage on ice is instantly recognizable when the throttle is mashed (traction control engaged) on the Blizzak WS80 equipped BMW 328i. The Blizzak car will easily win a drag race against an all-season equipped car. Stopping distances were equally impressive. 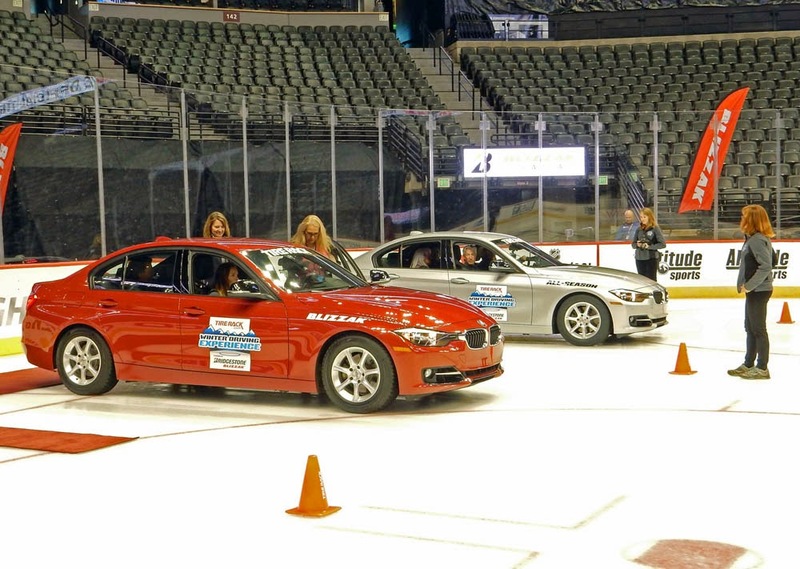 Blizzak braking distances were consistently 10 feet shorter at our test speed of 12mph. I was told that my 38 foot stops would compute to about 430 feet if I was making a stop on the ice from a speed of 45mph. A stop from 45mph on all-season tires would yield an ABS skid of nearly 800 feet. Bridgestone Blizzak ready for ice duty. Cornering the two cars on ice was like night and day. In low speed turns that sent the all-season car plowing straight ahead, the Blizzak car easily negotiated with the smooth confidence of a Zamboni. Is there a difference between a general purpose tire and a winter specific tire? Yes. There is a huge difference in my opinion. Bridgestone has been selling their Blizzak line of winter tires in the U.S. since 1992. There have been more than a dozen evolutionary upgrades throughout the years to improve cold weather performance. The Blizzak WS80 is their best winter tire yet. The Bridgestone guys think of their proprietary Blizzak tire compound as “black magic” when referring to their unique microscopic hardened particles imbedded in the relatively porous rolling surface. The idea is to keep the rubber soft and pliable at low temperatures while the imbedded “bite particles” claw at the slippery surface for traction. 2/32 inch: This is the legal minimum. The tire begins to lose grip on dry surfaces. 4/32 inch: The tire begins to lose traction on wet surfaces. Hydroplaning is more likely. 6/32 inch: This is the minimum depth for good performance in the snow.